The semi-final line-up in the Ballymena Saturday Morning League’s County Antrim Post O’Kane Cup is starting to take shape. Carniny Rangers and Ahoghill Thistle reached the last four with wins over Newpark Olympic and Wakehurst Star respectively. Carniny Rangers 2 Newpark Olympic 0: Carniny eased into a semi final after this win over a hard working Newpark side. The home side created a succession of first half chances with the Olympic defence finding it hard to clear their lines. Alan Fullerton’s cross from the right after 25 minutes was turned towards the net by Darren Kidd but a miraculous goal line clearance denied Carniny the opener. Carniny Centre back Alan Norton also came close to scoring before the break when his header from Shane Donnelly’s corner was well saved by Newpark Keeper Rodney Crawford. The second half started as the first finished with Carniny well on top. Carniny eventually took the lead in the 55th minute when Ryan Balmer’s left wing cross was eventually turned in by Shane Donnelly. That lead was doubled two minutes later when Darren Kidd found the net from eight yards from a Ryan Balmer low cross. In the other Quarter Final p;ayed on Saturday Ahoghill Thistle were two strong for Division 3 side Wakehurst Star and ran out 8-3 winners with hatricks for Matt Boyd and Alan Moore and two goals from Ryan Sands to set up a Semi Final with Carniny Rangers. Harryville Homers 4, Clough Rangers 0: The holders hit the ground running with a goal to savour in just the second minute from Darren Campbell who received the ball just inside the penalty box from Allan Rainey worked the ball onto his left foot before curling an unstoppable shot into the top corner from the edge of the box for one nil. The Harryville side doubled their lead on the half an hour mark through full back Ryan Stewart who stepped up to drill home a direct free kick from outside the area, scoring his now customary goal against Clough. Clough were handed a lifeline midway through the second half when stand in skipper Ian Russell conceded a penalty. But the chance was spurned by substitute Richard Gregg, who could only stand and watch in awe as Homer’s keeper Alex McCosh dived full length across the goal to push the ball behind for a corner. This spurred on Homers who scored goal number three shortly after this through Jasin Magill. The in form striker scoring with a very composed, right foot finish, again from outside the box, scoring his side’s 100th ompetitive goal of the season in just 16 games. The fourth and final goal was claimed by David Nicholl on full time. The midfielder out jumped Richard Gregg at the near post to head home Mark McKays corner to set up a quarter final tie against much improved Abbeyview this week. 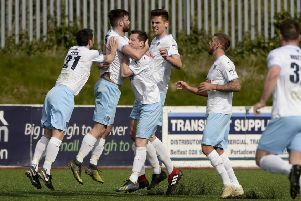 Raceview 1, Riverdale 2: Both these teams find themselves at the relegation end of the League so a win was essential in this match and it was Riverdale with new signings Jason Ritchie and goalkeeper Gregg Knowles on board came out on top with the three points. Riverdale had the dream start with a goal after 5 mintues when Clarke Lennox ran onto a loose clearance and cut inside a Raceview defender before firing into the bottom corner of the net. Raceview came more into the game in the latter part of the first half and their pressure paid off when they score at a corner kick in the dying minutes of the half. Ian Millar sent over a corner to the back post where Uel Adams was on hand to head home the equaliser. Riverdale started the second half the way they started the first with another goal when they were awarded a penalty kick when Clarke Lennox was brought down. Martin Young made no mistake with the spot kick hammering the ball down the middle. Raceview then went inchase of an equaliser and went close through aheader from Uel Adams which debutant keeper Gregg Knowles saved and he was on hand to make another great save from Reece Kernohan late on. Carnlough Swifts continue to lead Division Two and their 4-2 win away to Randalstown leave them unbeaten and with 32 points from 12 matches. Their main challengers Michelin lost ground with a 1-0 defeat by Seven Towers who are now in second place with 25 points from 13 matches. The other challenger Ahoghill Thistle were held to a 1 each draw by Cushendall and this leaves them on 24 points with two games in hand. League Leaders Atletico Antrim were held to a 2-2 draw at home to Rubys Rovers who are a point behind them having played the same number of matches. The main challengers are St Comgalls who are the only unbeaten side in the Division and are one point behind leaders Atletico Antrim but with two games in hand. Soutside Rangers are well positioned with 17 points behind the League Leaders but have 3 games in hand, The Division Three title race looks like been a close fought affair. The eagerly awaited Mortgage Solutions (Mill Street Ballymena) Top four Final between Harryville Rivals Carniny Rangers and Harryville Homers will be played on Saturday 19th December 2015 venue and time to be decided. firmus energy Division One: Abbeyview 3, Glenravel 1; Ballykeel 2, FC Moylena 3.
firmus energy Division Two: Cushendall 1, Ahoghill Rovers 1; FC Penarol 2, Woodside 2; Holywell 7, Galgorm Blues 1; Randalstown 2, Carnlough Swifts 4; Seven Towers 1, Michelin 0; Sporting Ballymoney 5, Waveney Swifts 2.
firmus energy Division One: All Saints OB v Clough Rangers (Showgrounds 5); Ballykeel v Glenravel (Ballykeel); Carniny Rangers v Riverdale (Wakehurst 1); Connor FC v Ahoghill Thistle (Connor); Raceview v Newpark Olympic (Broughshane). firmus energy Division Two: Ahoghill Rovers v Sporting Ballymoney (Ahoghill); Cloughmills v Seven Towers; Cushendall v Carnlough Swifts (Cargan); Galgorm Blues v Woodside (Galgorm); Randalstown v Holywell; Waveney Swifts v Michelin (Waveney 2). firmus energy Division Three: Cullybackey Olympic v Ruby’s Rovers (Tober Park); Northend & District v Southside Rangers (Dunfane); St Comgalls v Steadfast; Templepatrick v Atletico Antrim (Forum); Wakehurst Star v Braid United (Showgrounds 4).